Rare and sought after 'chemically heated' gauntlets. Manufactured in untreated suede/sheepskin with a shearling fleece lining. Chromed leather on the thumbs and gussets between the fingers. An adjustable press-studded strap runs adjacent to the cuffs. Inside each glove is a proofed cotton pocket used to hold a chemical 'Everhot' bag which when dampened would provide heat for upto six hours. In practice these gloves proved to be rather bulky and chemical burns were not uncommon. This pair is in rather worn condition. The right glove is actually quite good bar soiling and some stitched repairs to a couple of the fingers. The left glove has faired less well. It has a leather patch on the forefinger, a split near the base of the thumb and another patch at the cuff. The edge of this patch has split away from the glove too. 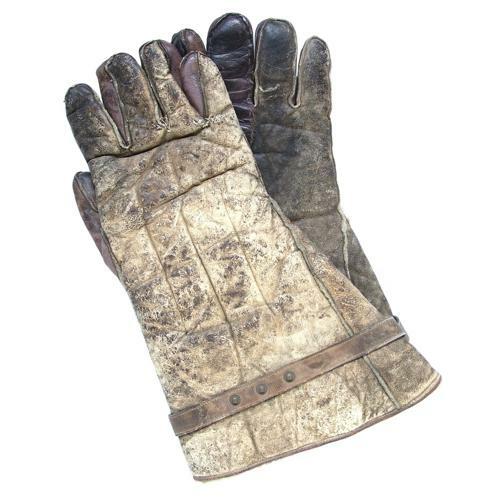 Both gloves retain the cuff strap, decent linings and the internal cotton pockets. As usual, no 'Everhot' pouches either. Priced accordingly. Stock code GA20661.